I couldn’t help but fall in love. Stepping into Bistro Vue is like being transported to the countryside of Provence. I was entirely convinced that when I looked out the window, I would see nothing but an expanse of tall grass and wild lavender. It is every bit the rustic French bistro it aims to be, and everything is so frigging adorable that I wanted to steal it all. Here for another restaurant express lunch, the set menu saved us having to go through the agony of choosing what to have. Instead, K and I had the liberty of sitting back, relaxing, and in my case, gawking around the restaurant. You would’ve thought that this wasn’t my first time seeing spindly tables, red velvet cushioned chairs, and floral plates to make hipsters jealous. But all of them, put together in the same room, along with vases of flowers and wide wooden doors was just too much for my inner girl to handle without squealing ‘OMIGAWD this place is so cute!’ every thirty seconds. We were poured a glass of wine each. A surprisingly light red for K, and a dry and slightly tart white for me. My face was as red as a tomato halfway through my glass. I’m so bad at grownup drinks. A small baguette of sourdough, still warm inside, melted the lashings of pale, creamy butter I slathered on top. A sprinkling of pink Murray river salt and black pepper completed one of the simplest pleasures in life. K thought I was joking when I said I wanted to put the butter in my pocket and take it home. To start, K and I shared an entree of Chicken Terrine with Pickles, Mustard and Sourdough. The smooth medallions of terrine were wrapped in paper-thin slices of fluoro orange carrot, the meaty flavour brought out by the sharp pickles and a smear of tangy mustard and relish. This was a fun dish to play with, the different elements allowing us to mix and match to our hearts content. Our main of Roast Lamb Shoulder with Pommes Moussline and French Beans was a study in elegant wholesomeness. Three slices of melt-in-mouth lamb sat upon a cloud of mashed potatoes, which was lusciously creamy in a way that you know can’t be good for you. The tumble of vegetables on top was a delicious reminder of the delights of the garden, the soft rhubarb stalks in contrast with the translucent crunch of radishes. Our meal was finished off with a Pistachio Soufflé with Cream. The pistachio soufflé was light and airy, and a spoonful of the dish was almost like eating pistachio cream on regular cream. The crunchy pistachios are the bottom were a welcome contrast in texture. However I’ll admit that I did eye up the enviably perky soufflé the table next to us received. We were offered coffee and tea to finish up, and my robust yet balanced flat white was served with two small orange canneles, which were addictively chewy on the inside, and slightly crispy on the outside. 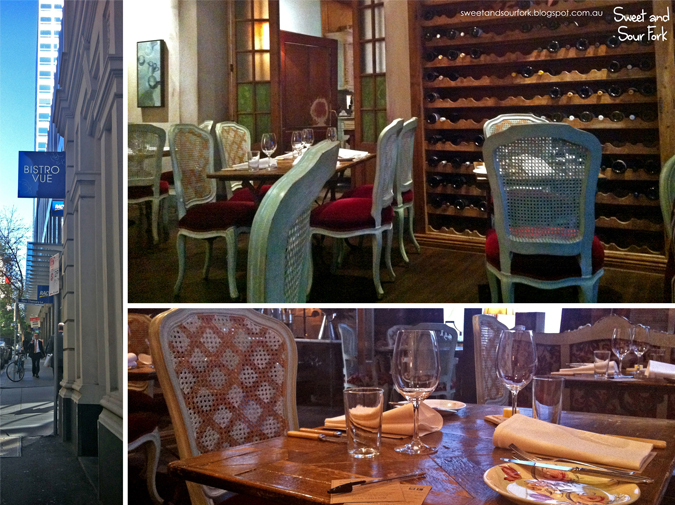 Bistro Vue served up an excellent lunch that was a pleasing balance between refined and rustic. The staff were professional and unobtrusive, and the whole meal ran like clockwork. I wouldn’t hesitate to come back for a taste of their full menu, or even just for the butter. And to steal some more plates of course. this place is really good for dessert especially the tart tartin!! cannot stop raving about the dish :) i think the orange cakes are called cannelles, i'm not too certain. but they're soooo goood.